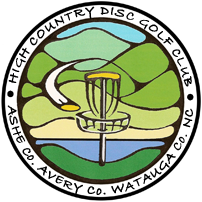 The High Country Disc Golf Club of Ashe County Park in Jefferson, North Carolina. Visit our Page and "Like" us on Facebook! @ Ashe County Park, in Jefferson, NC. Special Thanks to: Innova Disc Golf, Ashe Co.Parks and Rec. Dept., Joe Boccardy, Daniel Quin, Rita Privette, Wendy Patoprsty, Todd Lion, and all our sponsors and supporters! It just might be or become one of the best courses in the world? Nestled on the backside of Phoenix Mountain in the beautiful and scenic Appalachian Mountains, the new Ashe Co. Park course is an extremely cool disc golf experience that offers a little bit of everything. It's both FUN and challenging for all skill levels with hills and thrills, nice views, water hazards and OB's. There are concrete and/or platform rubber deck TEE PADS on every hole!! Thanks to INNOVA DISC GOLF! Course Map and Walkthrough Photos. (w/ alternative 8 and 9, "the short loop"), and a practice basket. The course kiosk and directional signs/arrows should help you easily find your way a round. Scorecards can be printed out online at the sites homepage or at the links below. You might be Lucky enough to find one left in the mailbox at the course (please take only one). tee pads on every hole. • Total Par from the Pro (blue) tees is 61. • Total Par from the Amateur (white) tees is 57. Please refer to scorecard for distances and course layout/map! **Note** There are two baskets on holes 8, 11 and 17! 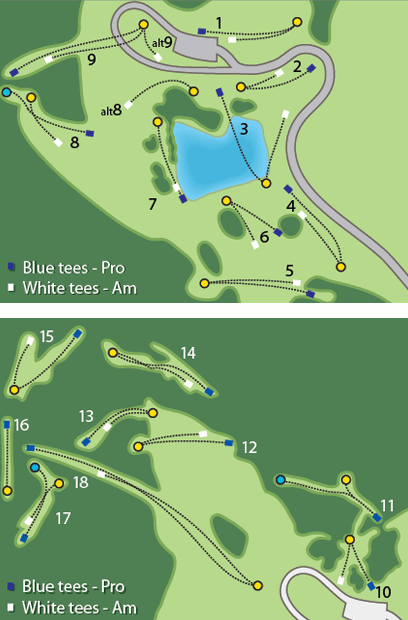 Pro (blue) tees play to Carolina blue baskets, and Amateur (white) tees play to original yellow baskets. Also, there are no tee signs on the Pro (blue) tees, but there are signs on the Amateur (white) tees. Please remember that this course is still very much considered to be in the establishment period, so be respectful and understand that the rough is supposed to be rough. If you break or damage any living thing on the course, you will be prosecuted. Do your best to stay on the trails provided! Also, use a trash can, or pack it in pack it out! This includes cigarette butts! You should also be aware that this course is in a multi-use county park, so be extremely careful and conscious of other park users before throwing your discs!! If you hit someone, it will be your fault and your responsibility. Last thing, wear good shoes!!! This is a mountain course and the hike can be pretty strenuous and demanding. BE SAFE and ENJOY THE ROUND! Ashe Co. Park Open Daily to the Public between the hours of 8:00am until Dusk (15 min. before dark according to season). The course is closed for a few special events each year. 8:00am until Dusk - Free to come and play everyday of the week. From Boone, NC: Travel East on Hwy. 421 to Hwy 221 North. Turn Left onto Hwy. 221 North. From Wilkesboro, NC: Travel West on Hwy 421 to Hwy 221 North (just past Parkway). Turn right onto Hwy. 221 North. Take Hwy. 221 North towards Jefferson, NC for about 15-20 min's. Go straight thru first intersection w/ light (Hwy junction 221 and 163). Soon after, you will come to another intersection w/ light. *If you need to do any shopping, this is pretty much last Content for class "infoz" Goes Herecall (Al-Mart, food, etc.). Take a right, and get what makes you happy! If you're already happy, continue North on Hwy. 221 for a couple more miles to the next intersection w/ light. That should be Long St. Take a left onto Long St. It dead ends pretty quickly into S. Main St. (no sign). There should be a Dollar Mart gas station on your right. Take a right onto S. Main St. and go straight thru the next intersection w/ light (Yamaha dealer, Carolina Printing on corner's). Once you pass thru that intersection the road changes to N. Main St. Just keep on going for a couple more miles until you see the Ashe Co. Park Sign on your left. Take a left onto Ashe Park Rd. and follow to park. Turn left into park, follow road around till you find a parking area w/ the course kiosk and Hole #1 nearby. Enjoy! Drive Safely, Hwy. 421 is a notorious speed zone! The High Country Disc Golf Club would like to thank it's Founding Course Sponsors. Carolina Printing and Supply, 102 East Main St., Jefferson, NC. 28640, (336) 846-7444. They are very generously donating all the printing costs, time and labor to help keep scorecards available at the park. Hole 1 - Mel and Cara Jones, Smryna, TN. Hole 2 - Matt Dewhirst, Capricorn Construction, Boone, NC. Hole 3 - Tom Owens, The Gallery Woodworking Company, Boone, NC. Hole 4 - Los Arcoiris Mexican Restaurant, Jefferson, NC. Hole 5 - Sam and Edna Tree Farm, Laurel Springs, NC. Hole 6 - Hobby Barn, West Jefferson, NC. Hole 7 - Dr. Pepper Bottling Company, West Jefferson, NC. Hole 8 - Skyline/Skybest, West Jefferson, NC. Hole Alt. 8 - Mountain Select Properties of Ashe, Walt Petersen, West Jefferson, NC. Hole 9 - The Powell Family, Hickory, NC. Hole Alt. 9 - The UFO Club of Hickory, NC. Hole 10 - The Disc Golf World News, Rick Rothstein, Kansas City, Mo. Hole 11 - Yadkinville DGC, Yadkinville, NC. Hole 13 - Michael Bennett for Project Digital, Boone, NC. Hole 14 - The Coyote Kitchen, Ben Whitehead, Boone, NC. Hole 15 - Western NCDGC, Asheville, NC. Hole 18 - Mel and Cara Jones, Smryna, TN. Volunteers Needed! Help support disc golf in the High Country! Let us know how you can help? We are looking for Sponsors, donations, and volunteers?